The iconic style and glamour that superstar Elizabeth Taylor was renowned, for can now be experienced by luxe-lovers as her former home is now available to rent. 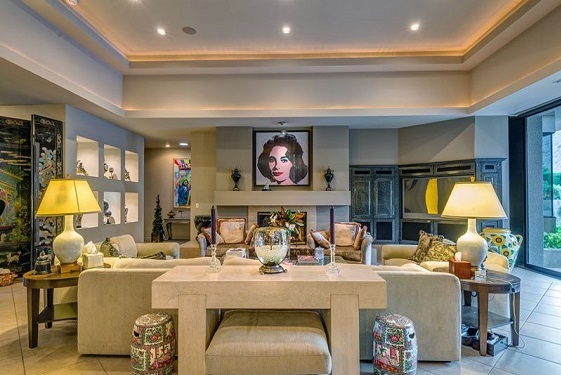 Located in the upmarket Las Palmas neighbourhood, Palm Springs the gated ‘Casa Elizabeth’ property sleeps eight and features four bedrooms, four-and-a-half bathrooms and is as ornately decorated as you would expect for the Hollywood Queen. The property was furnished and renovated by Taylor’s friend the former supermodel Kathy Ireland, and is often referred of as 'The Jewel of the Desert'. On display throughout the property is an impressive collection of original artwork including the iconic Andy Warhol paining of Taylor and also pieces painted by the lady herself. The best place to enjoy the year-round sunshine of the ‘vintage luxury’ property has to be the outside area featuring a large pool area with waterfall features and a spa, Cabana, outdoor shower and kitchen. The beautifully manicured lawns are surrounded by views of the mountains and is the perfect location for posing by the pool (while draped in diamonds of course, daaarling). Palm Springs is a favourite of The Luxury Travel Bible, and is known as ‘Hollywood’s Playground’ for being just two hours from the Hollywood studios in LA and was once homes to stars including Frank Sinatra, Elvis, Marilyn Monroe and Dean Martin. How very glamourous!